Finance Minister Arun Jaitley on his maiden visit as minister to Washington, DC, addresses two think thanks, leaves American Establishment impressed, reports Aziz Haniffa/Rediff.com. Finance Minister Arun Jaitley, on his maiden visit to Washington, DC, as minister, address two think tanks and used the opportunity to enthrall America Inc with his refreshing candour and assurances that India is indeed open for business. He, however, warned that dire challenges remain. On Thursday, in an interaction at the Peterson Institute for International Economics on tax reforms in India, Jaitley, who is in Washington to attend the spring meetings of the World Bank and International Monetary Fund, acknowledged that 'opening the door and inviting investors and laying out the red carpet is the easy part, but keeping the investors waiting on the red carpet indefinitely is an anathema to business'. Downplaying the media hype that India will overtake China as the fastest growing emerging economy next year, Jaitley told the interaction following his address at Peterson had India undertaken market reforms 20 years before 1991, it would have been a different story today. Drawing comparison between the two countries, Jaitley pointed out that while China, being a communist country has the freedom to take unilateral decisions, India’s parliamentary democracy, though a great institution, is also a deterrent, as it requires a "decision making process in several areas where you have to carry a large number of people with you." Jaitley said India does have the potential to grow at 9 per cent, but to achieve that the present Modi government needs to continue at the Centre for a reasonable number of years. It maybe noted that this is the first majority government in India, post 1991. The FM, however, cautioned that "a lot of distance is yet to be covered." Admitting that India's mind-boggling bureaucracy is a great barrier, Jaitley said a task-force has been set up to check if all prior permissions required for establishing a business can be substituted by a single regulatory mechanism. Jaitley, however, added that he has no illusion and that "it could be crystal-gazing because it’s a very difficult challenge". A day earlier, on Wednesday, Jaitley, who addressed the Center for Strategic and International Studies, also acknowledged that the land reforms bill remains a contentious issue and could torpedo the government's efforts at job creation. "One of the areas where we are trying to ease the (land) acquisition process is creation of industrial corridor as this is capable of providing employment to a vast number of people in rural areas." At Peterson the next day he followed this up with the explanation, "Rather than just have a cluster of industries in one part and nothing for the next 100 miles it made sense to have running corridors through rural areas, where at least 30 crore (300 million) don't own any land." Jaitley also assured potential investors that retrospective taxation is a thing of the past and that the Modi government was fully cognizant of how damaging it was to the image of India. "We are not a high tax government and, therefore, our taxation policy is going to be guided by that principle," he said. He informed the gathering that tax rationalisation would soon become a reality in India as it switches to Goods and Services Tax or GST. 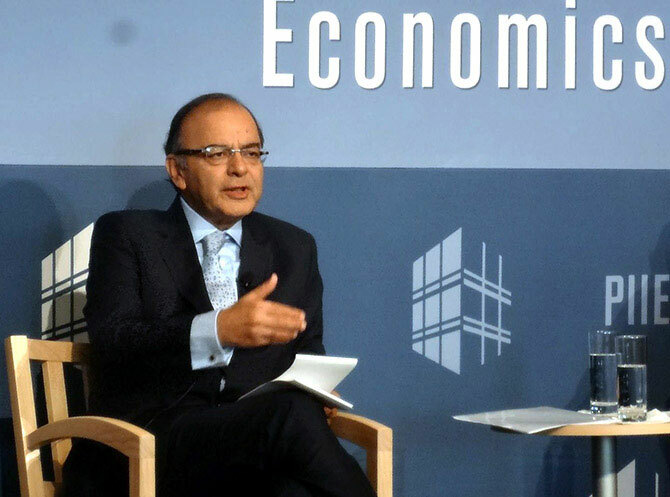 Image: Finance Minister Arun Jaitley at the Peterson Institute for International Economics on Thursday.